My first exposure to Jeff was on none other than a scuba message board. Someone had written that they'd taken a course of photo instruction from Jeff and they were very pleased. They said it was well worth the money spent. That was enough for me, as I'm always looking to improve my skills as an underwater photographer without spending tons of cash. I emailed Jeff and let him know I'd be in Bali in September 2008. Jeff showed up with his wife Dawn at Scuba Seraya, where I was staying. I was no newcomer to Underwater Photography, having started with a Nikonos V and having moved to digital a few years ago. I had been on a few trips using my camera, but Jeff opened my eyes to lots of things I could do to improve my underwater images. He is very thorough. To make sure he knows where you're coming from, he spends a few hours with you before even entering the water. He gave me some tips on white balance and the proper settings for sharpening, among other things. Dawn then joined Jeff and I for our first dive together. Dawn served as a spotter, a job she performed admirably. 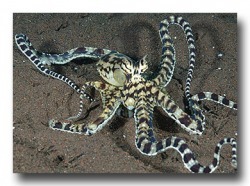 She found us a Mimic Octopus and several beautiful nudibranchs. Not only did she spot marine life to photograph but she also found my muck stick, that I'd brought halfway around the world specifically to use in Indonesia, and had inadvertently dropped during the dive. I was so pleased with the instruction I'd received from Jeff (and Dawn) and how much my images had improved, that I scheduled another day of diving with him at the Liberty Wreck. 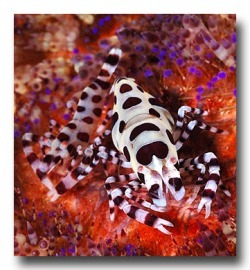 I was able to get more images and learn more about good underwater photo technique. Again, Jeff's very sharp eye noticed something which he later told me about. My housing (a Subal housing) is quite heavy and he pointed out to me that I was sinking just prior to taking the shot. My heavy camera needed buoyancy arms I found out! Jeff showed me what he did to combat the problem and how to fix it. Yet another tip to solve a problem I would not have realized on my own! In short, Jeff's underwater photo instruction was well worth the money I spent. I would hire him again in a heartbeat. Jeff and Dawn are wonderful people that I now consider to be my friends.